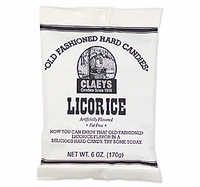 Licorice drops Claeys old fashioned hard candy. A black licorice hard candy with a sweet sugar coating also known as a sanded candy. Claey's old fashioned drops are available in many flavors. Lemon drops, wild cherry drops, sour apple drops and horehound.